People come from all over the world to see us at the Blue Tree Clinic for all kinds of reasons. You may want some advice on your life situation or want help in developing personal skills, or you maybe struggling with a number of issues which our friendly therapists have experience in treating. You maybe going through a particularly difficult time or you may not want to wait months on a waiting list for treatment to help you move on with your life. At the Blue Tree Clinic we strive to be as friendly and helpful as possible and we know plans change!If you cancel or change your appointment up to 48 hours before there is no charge. Inside 48 hours you will not be refunded your session fee. This is because your clinician has made plans to meet with you, it is an important part of the agreement in therapy that you respect each other’s time. Your therapist will not cancel you unless there is an emergency. How can seeing a nutritionist help me? Many of us don’t take the time in our busy lives to eat well. We can help you with feeling better through healthy eating and weight management if needed or support with eating disorders with our friendly and experienced nutritionist Rhiannon. Yes everything you bring to a session is confidential, with the rare exceptions of cases where you are at risk to yourself or others, then your therapist or Doctor may want to contact other professionals or your GP for instance to get you more help should you need it. How many appointments will it take to get me feeling better? The number of appointments you may need can range from a single appointment to talk about a particular issue. Your doctor or therapist will always be trying to help you as quickly as possible to get you feeling better. Often people like to attend for some weeks or months to address a long standing problem and we will aim to help you as much as possible in making this affordable with disounts for block bookings or a course of treatment. Do I need a Psychiatrist or a Psychologist? When people are unwell they made need a medically qualified doctor / psychiatrist to help them.A psychiatrist can rule out any physical cause to you not feeling yourself. They can order tests and prescribe medication as well as giving therapy. If you are unsure if you would rather see a psychiatrist or psychologist, you can come in for a free consultation and we will help you with your decision making or you can just give us a call. Can I speak to former patients to check the level of care they received? Can I do work experience at your clinic? We get lots of calls about this, we are sorry we do not take on people for work experience but internships are available annually. Please email us about this if you are interested in gaining experience in mental health, you must have a degree in psychology or a social science to work with us. Yes we have therapists that specialise in couples work, these are usually 90 minute or 2 hour sessions, and we have a high success rate? Why do I need to pay in advance for my session? Unfortunately we have had clients who do not show up when their doctor or therapist has made a lot of effort to be there for their appointment, and so we do need to take payments by our secure Go Cardless System which is regulated by the FCA to ensure you are protected. You are also welcome to pay on the day before your sessions starts. At this time we do not accept credit cards, to remain as competitive as possible. We are one of the only Harley Street Clinics to offer discounts to students and NHS or emergency workers. I.D. is required. We aim to give people an appointment as soon as possible. This is usually within 7 days. 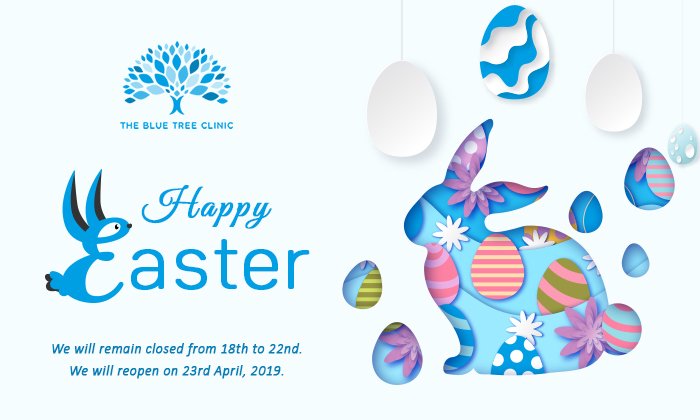 Please write to us at reception@thebluetreeclinic.com where the Clinic Manager and the Clinical Director will address your complaint and provide a response within 14 days. Why are your fees for autism and aspergers assessments so much lower than other Harley Street clinics? Our Doctor and Clinical Director do not believe in people that can not wait on the NHS waiting lists any longer having to be forced to pay £5000 or more for urgent asssessments, therefore we offer a more affordable way for people to access mental health care assessments at more affordable pricing. We always act with integrity and use the finest therapists and doctors who have your best interests at heart. Are your staff all registered with the appropriate professional bodies? Yes all our staff are members of Royal Colleges, the GMC and the Psychological College’s. They all undertake appraisal and regular supervisions. We also meet as a team to address any concerns we have about our patient’s giving families and our patient’s extra backup and support if needed. Professional meetings are also offered to our patients, and are routinely held when problems occur. We respect confidentiality of course and these are only held when the client has consented. How do I know your reviews are real? We take our reviews and compliments and complaints seriously. We can often put you in touch with those that have agreed to be videod or have done an audio or written review on our site or on google or facebook. We are aware that lots of other clinics fake their reviews, but we do not. If you are worried you won’t get a good outcome from booking we encourage you to call for a free chat with our medical director or clinic manager and come in for an assessment, there is no commitment to return. I can’t get to your clinics, can i Skype or use the phone for a session? Yes absolutely. Just add us on Skype – Thebluetreeclinic and email us your username, we have many patients that use Skype from abroad that do this every week. Will the Psychiatrists push me to have medication? No our medical team believe in treating with medication but only when necessary and will help you to come to the best treatment plan together. This may involve therapy over medication but they also believe medication has an important role. Do I have to commit to coming ever week? Often therapy works best if you come every week but no some clients like to come every month or whenever suits them. Yes we see many clients who want a second opinion and a second report on their situation. I don’t think I can afford private health care, can you help? You may be surprised with our affordable therapists, we have a great team that will do our best to help you, contact us on our contact form or email us at reception@thebluetreeclinic.com or charlotte@thebluetreeclinic.com. Can I come and see you from abroad? Yes we have clients that fly in and we have flown abroad to see clients as well – we can do a lot of work in a limited time and your therapist will make time to give you as much help in that time. We have seen many patients from Saudi Arabia, Abu Dhabi, Europe and America. I need a prescription because I am visiting or living in the UK from abroad, can you help? Yes please book in with our doctors. Do i need a GP referral to come and see you? No you don’t, you can refer yourself or your friend / family member. I have a question that is not here, what can i do? Contact us on our contact form or email us for a speedy reply or give us a call, lines are open 24 hours a day, 7 days a week.